The Client is one of the top Health Care Institute, Providing different type of Health Care Solution & Treatment. Their focus is on assisting people with some of the most complex conditions — like Insomnia. Their innovative products improve the quality of life of people around the world and help them enjoy longer, healthier, and more productive lives. STPL's Software Development Service augments resources of any Software Development Group- Software Product Company to an internal IT function- in translating their product vision and technology leadership into functionality and features that bring value to end customers with quicker turnaround and more mileage from their IT spend. At STPL, we safeguard the client's intellectual property, proprietary software and new development specifications. On completion of project, Clients retain full ownership of all intellectual property rights and software source code. We focus on helping you to get your project done Quickly, Efficiently and Effectively. Customer Delight: A commitment to surpassing our customer expectations. Fairness: A commitment to be objective and transaction-oriented, thereby earning trust and respect. Pursuit of Excellence: A commitment to strive relentlessly, to constantly improve ourselves, our teams, our services and products so as to become the best. Increase visibility and enhance relationship with key decision makers. The global delivery model with faster delivery at lower cost. 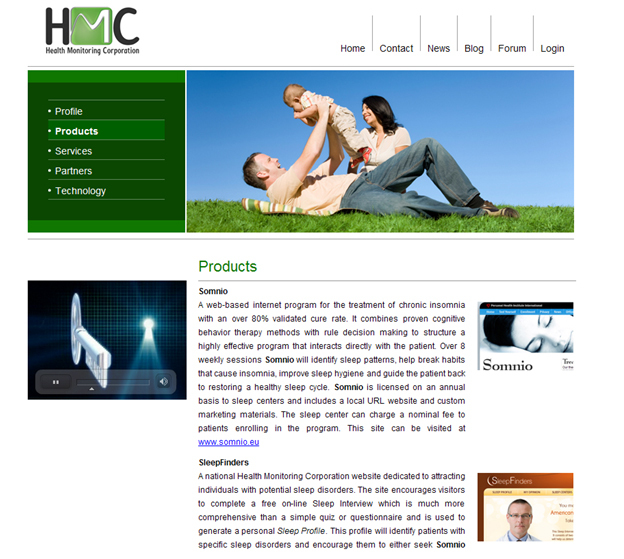 HMC introductory products include a web-based internet program for the treatment of chronic insomnia and a national website dedicated to screening site visitors for sleep disorders. 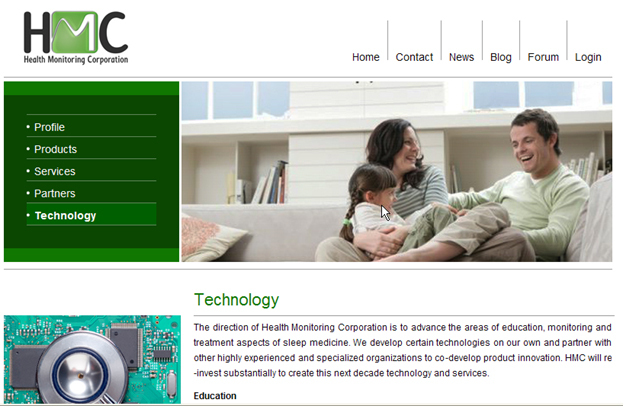 Products in development concentrate on health monitoring technology specific to sleep medicine. Our decades of experience and networking capabilities allow us to provide consultation and management services for a variety of projects. 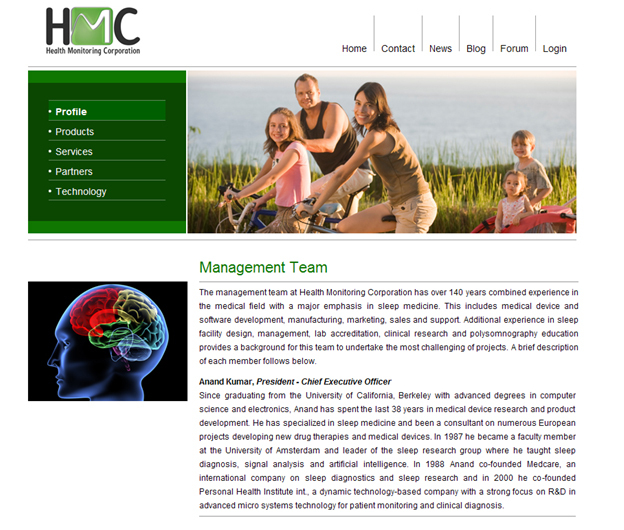 Profile page contains the Management Team profile, who is involved in Health monitoring system. 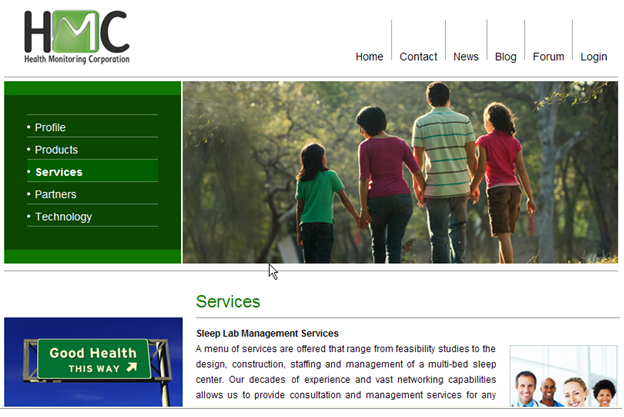 Company has two other projects which deal with health management for the people to know about the sleep disease. 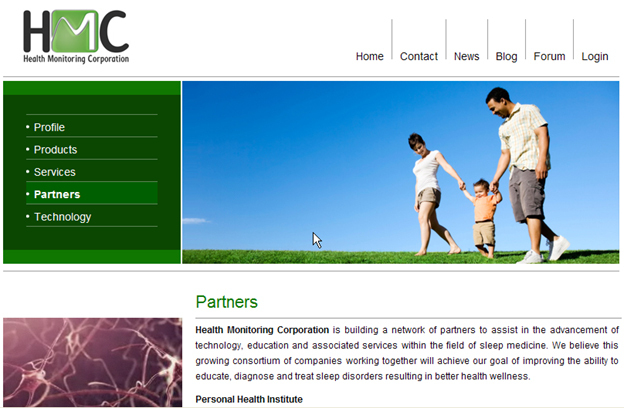 Health Monitoring Corporation is building a network of partners to assist in the advancement of technology, education and associated services within the field of sleep medicine. We believe this growing consortium of companies working together will achieve our goal of improving the ability to educate, diagnose and treat sleep disorders resulting in better health wellness. 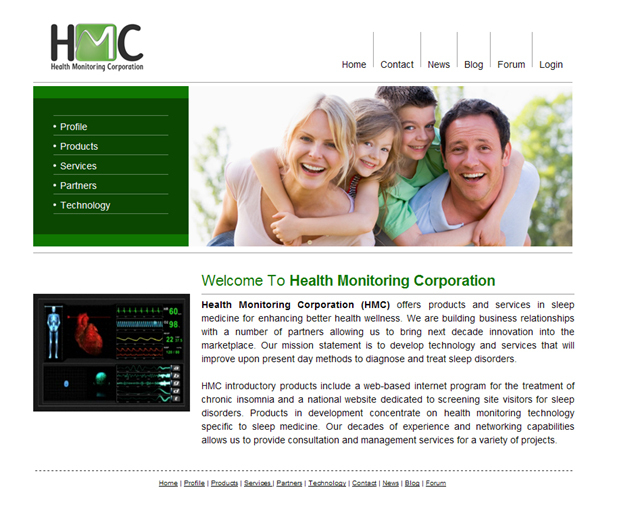 The direction of Health Monitoring Corporation is to advance the areas of education, monitoring and treatment aspects of sleep medicine. We develop certain technologies on our own and partner with other highly experienced and specialized organizations to co-develop product innovation. HMC will re-invest substantially to create this next decade technology and services. Synchronization of all content on the site was challenging as the goal was of creating applications that are as rich and responsive. The client intended to have the site build with latest cutting edge technologies like dynamic flash so that the information received by the users is accurate; this site data associated with other sites. A high level interaction was provided by using Flash. Flash was extensively used in this application. Dynamic video flash based component is used on Partner, product and Home page.